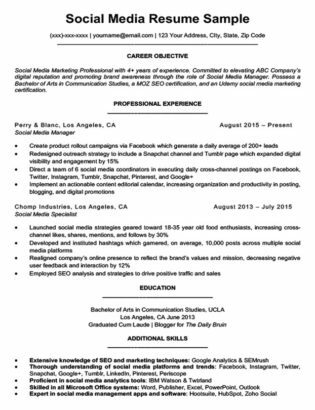 New to marketing and need resume inspiration, or have a few years of experience and want to polish up your resume? Read more to find out how you can set yourself apart in this rapidly developing career field with our marketing assistant resume sample and tips. If you would rather start right away, try using our simple yet effective resume building tool that provides thousands of career and skills bullet points for you to choose from. Resume Companion has sample resumes for a wide range of industries. Browse through other occupations in our free resume database. 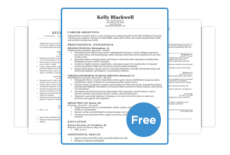 Choose from a variety of template styles and create an unforgettable resume! Have a look at our comprehensive list of useful cover letter examples if you need fresh ideas for a marketing cover letter. Action-oriented marketing specialist with three years of experience in digital and event marketing. Seeking a position at Visionary Marketing Solutions where I can use my SEO, SEM, and event planning skills to deliver results and provide solutions. I completed an internship at Mt. Everest Software and have a B.A. in Marketing. 1. Sprinkle in statistics, numbers, and figures. Making your achievements measurable is a key tactic to get noticed early on in the job searching process. Recruiters want to know exactly how you can contribute to the company, so the more you try to include digits in your work experience section, the better. 2. Build upon and clearly define your skills. The skills section of your marketing resume will give the hiring manager or recruiter a clear picture of what your capabilities are. Adjust the order of your skills based on what the job description sees as most important. For example, if one marketing assistant position emphasizes keyword research and Google Analytics knowledge, make sure these are at the top of your list. Not sure how to describe your abilities? We’ve researched and aggregated a list of the top desirable skills that employers seek in marketing assistants. See which skills or experiences you have that you can include in your resume. Content marketing: This simply means creating and distributing content for consumers. Content can mean video, text, or audio. Marketers tend to have a specialty, so take the time to familiarize yourself with the channels of communication used in this field. SEM/SEO: Search Engine Marketing (SEM) used to include Search Engine Optimization (SEO), but nowadays it strictly means paid search advertising. SEO is the process of making web content in the top rankings in search engines. Content Management Systems (CMS): These include blogging sites such as WordPress, Drupal, and Joomla. Mobile marketing: A multi-channel marketing strategy aimed at connecting with the target audience via smartphones, tablets, or other mobile devices. Video production: Any experience in creating or editing videos is often highly sought-after. More businesses are now looking to reach out to consumers through video, and even consumers say they prefer videos over other forms of content marketing. Customer Relationship Management (CRM): Customer relationship management is the method used to maintain and build relationships with your customers. Salesforce is an example of a platform used to engage with customers and manage sales and productivity. Coding and web design: HTML, CSS, and other coding languages are valuable assets to have in any career path. Basic knowledge of how to code is useful when producing digital marketing campaigns or working with web developers. Paid social media advertising: Companies use demographic information to reach out to specific audiences so that they will see a brand on their social media accounts, such as promoted Tweets or Facebook posts. Lead nurturing: This is a technique of fostering relationships with buyers when you’re in sales. It focuses on marketing and communication efforts on listening to the needs of prospects, and providing the information and answers they need. Email marketing: A type of internet marketing that uses email to promote products or services. UX Design: User Experience Design involves designing a product in a relevant and appealing way. UX Design encompasses all aspects of integrating a product – the why, what, and how consumers use it. Data science and visualization: Data science is the study of where data comes from, what it means, and how it can be used for your business. Python and SQL are examples of languages used in data analytics. Data visualization takes the information and presents it in the form of statistical graphs, plots, and graphics. Consumer behavior: Knowledge of consumer behavior means you have studied how people make decisions about a product. This study incorporates psychology into marketing strategies. In our resume sample, the highlighted skills all show competency in marketing software and tools. 3. Make your career objective or professional statement the heart of the resume. Focus on what you can offer to the company as opposed to what the company can offer you. The career objective is your sales pitch – a statement which explains why would someone want to hire you instead of another candidate. If you’re changing industries or just starting out, the career objective will be helpful to employers, since your work history may not overtly show your goals. In your objective or statement, clarify which skills, knowledge, or past experiences will help the company achieve its needs. Focus on what you can offer to the company as opposed to what the company can offer you. Digital marketing professional specializing in video production with 3 years of experience. Seeking a job at Mt. Everest Software where I can use my background in video creation, editing, and SEO knowledge to bolster the company’s social media presence. I have a B.A. in Marketing with a minor in Broadcast Journalism and possess a Google AdWords certification. If you’re still struggling to come up with a unique objective, check out our in-depth guide on creating a personal statement that will get you that dream job!